With all the ups and downs I've had on this project, this is the block that kept me going. I love sunflowers. And I have to say, it's very satisfying to finally see them coming to life! The block is fused, but not stitched. The project is my adaptation of Nancy Rink's "In Remembrance," from her book El Camino Real. Rink's blocks finish at 14" x 18" (36 x 46 cm). I have enlarged mine to finish at 20" x 24" (51 x 61 cm). This changed the proportions of the block to make it relatively a little wider. But, since there is no full size layout in the book, you have to figure it out yourself anyway. So, I decided to make it work better for me. I didn't get very far, only one is sewn! But, I liked the colours, so I used the same fabric combinations for my enlarged, fused, version. I put these back in the box for now. Maybe I will make a pillow later. Anyway, that's five of nine now fused. You may click here to see all the previous posts on this project. Now there are four more vase arrangements left to do. It is a heap of fun! full of sunshine this block lovely. Your colors are perfect! 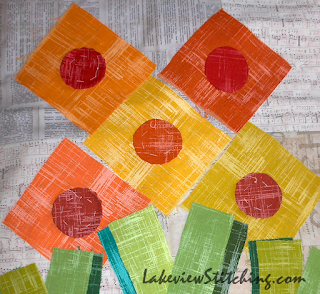 Makes me want to go dig around and find some bright, happy fabrics right now! This is such a cheerful block. 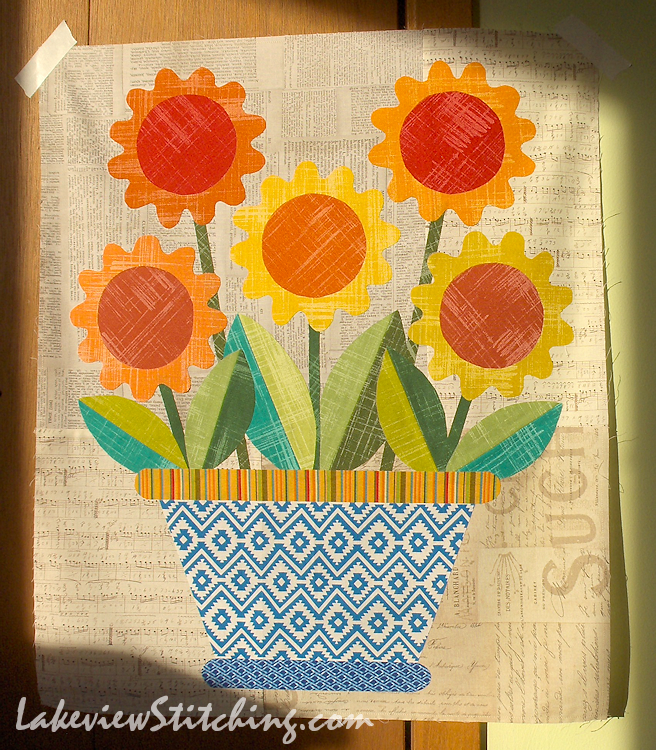 I love the fabrics you used for the pot and the contrast between the blue and white and the stripey one on the rim. This whole project seems like a load of fun. A very fun and happy block--I love the sunflowers! The fabric used for the pot is pretty cool too! What fun flowers! I like that you used five different yellows/oranges for the flower petals and for the centers. You know, I think this would be beautiful on a wall. Add a border or two.... It would cheer a body all year long! Those colors make the block just sing. Sunflowers are happy flowers. That stripe is the perfect choice for the pot! Thanks, Terry! Rink's quilt has a similar striped fabric, a nice yarn dye. That yellow bar code stripe is from my stash, and originally from Connecting Threads. Funny story, though, I nearly took it out and replaced it with the same blue as the bottom of the pot. But then the pot dominated the flowers, so I left it after all! The sunflowers and the colors you've chosen are delightful. It's a beautiful summery block. I especially like that little bit of teal you added in. I love this! Happy to learn you are delaying your summer hiatus. The increased size really works here, doesn't it? Love the fabric in the pot - great choice. Thanks, Jillian! Yes, they are almost life sized now. I've been debating how to stitch them for several days now, too!